Backing up iPhone data regularly is really a good habit because you can easily get your data back in case your data is lost or your phone is stolen. iTunes works as one of the best and convenient ways to back up data for iOS users. If you have synced your iPhone, iPad or iPod touch data with iTunes and later your data is deleted or lost accidentally, you’ll never be panic since in this article we’ll show you 2 best methods to recover data from iTunes backup with ease. As a versatile multimedia tool, iTunes is just done well not only in backing up iOS date but also restoring backup. If you'd like to restore your iTunes backup, you can now follow the simple step-by-step guide to learn how to do it. Step 3: Select the most relevant backup according to the date and size of each one and then press the "Restore" button to begin to recover data from iTunes backup. Wait a while until the restoration is completed. Note: Using this method means the backup file will overwrite your current data on the device, so you'd better make a backup for it. Besides, you're not able to preview and choose what kinds of lost files for recovery. 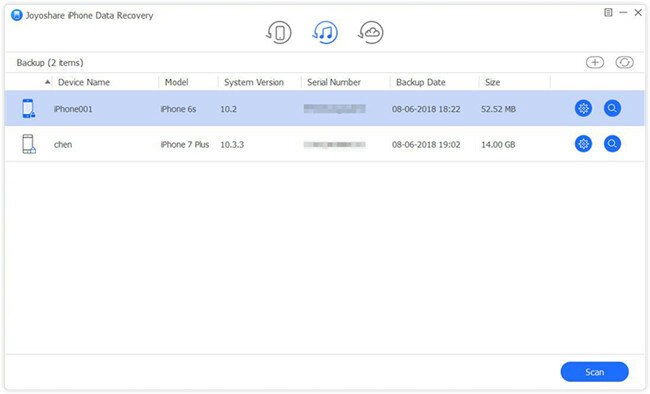 So, if you want to recover lost data from iTunes backup but you don't want to recover all data but just lost ones, you can ask a third-party iOS data recovery tool for help. Joyoshare iPhone Data Recovery is here to get you out of this trouble. It is an easy-to-use yet powerful iPhone data recovery utility that can restore data from iTunes backup, iCloud backup or iPhone directly. 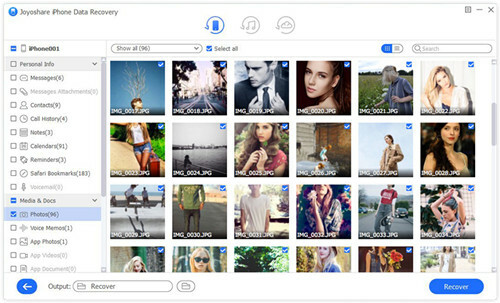 Even if your iTunes backup files are encrypted, Joyoshare can also recover lost data from them with no problem. Amazingly, this smart program gives you ability to preview your lost file in real time and then recover the selected ones you want at a ultra-fast speed. 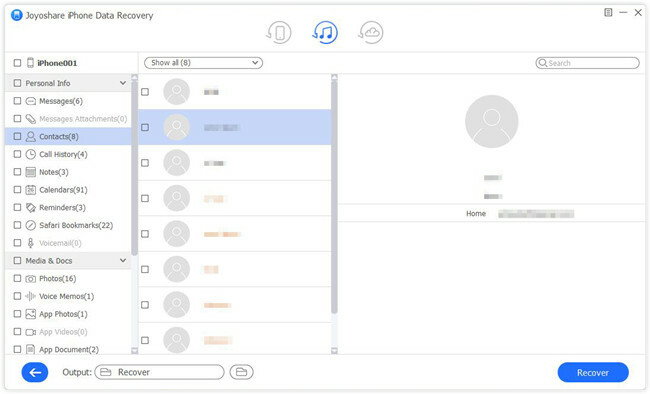 It supports more than 20+ types of lost data recovery including contacts, photos, text messages, WhatsApp, Viber, Kik messages, audios, videos, etc. No matter how you lost them, such as iOS upgrade, system crash, device stuck, etc, Joyoshare will bring them back with highest success rate. Recovering lost data from iTunes backup with Joyoshare iPhone Data Recovery is super easy, and the following guide is for your reference. 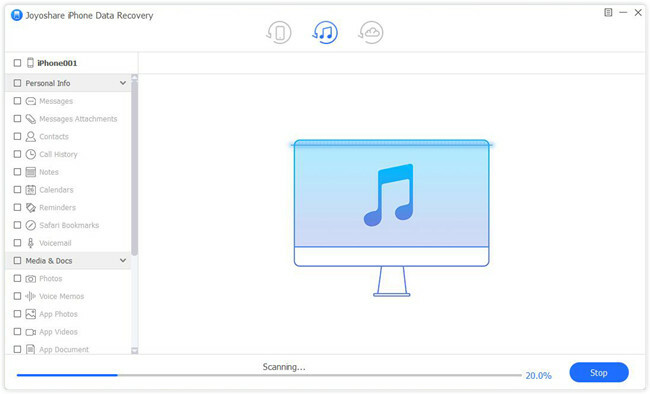 After downloaded Joyoshare iPhone Data Recovery and installed it on your desktop, you can simply launch it. Then select the second recovery mode - "Recover from iTunes" on the top menu bar. Here all your iTunes backup files will be detected and displayed orderly. 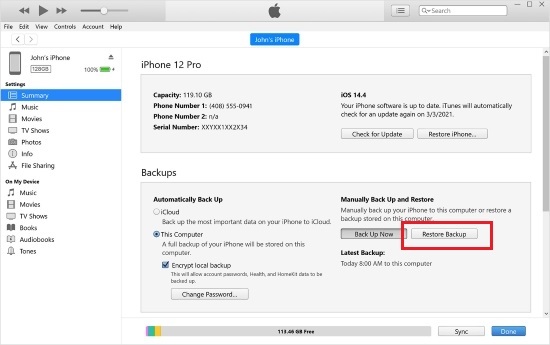 Look at the date and size of each backup and pick the most relevant one. Then press the Gear icon beside it and tick the data types you'd like to recover. After that, just click the "Scan" button to ask Joyoshare start to analyze the backup file. Once the scanning process is finished, you can now preview all recoverable files and pick the wanted ones. You're also able to locate the deleted ones by filtering out "Only show the deleted" option. After found out all you want, just press "Recover" button at the lower right corner to recover lost files from iTunes backup in seconds.